“Have you heard about Etsy?” my daughter asked me about three years ago. “What? Etsy? No, what is it?” I responded. She proceeded to tell me it was an online shopping site that featured primarily handmade items. She thought it was pretty neat and suggested I take a look. And I did take a look. It seemed to have some very interesting items and was nicely set up and certainly if I were looking to purchase some handmade item, I would check out this site. At that point I had been selling antique and vintage items on eBay for a decade or so. The fees had continued to increase over the years and I would certainly consider an alternative venue if there were one out there. But I didn’t think there was an alternative. Oh, I had looked, however nothing seemed to have the star power that eBay had. And then it came down to the spurtle. The spurtle was the straw that broke the camel’s back. Actually, when I listed this spurtle on eBay I listed it as an antique toy billy club. 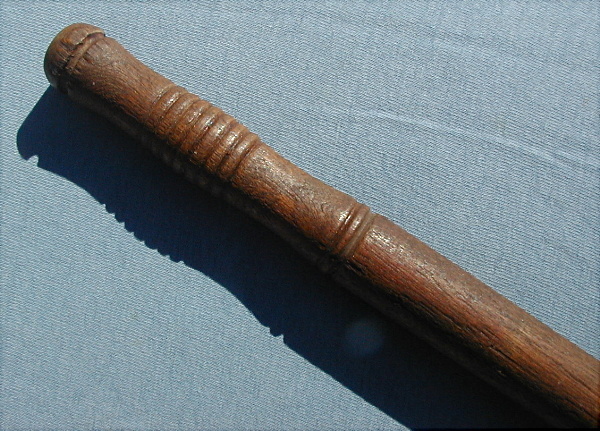 The listing was quickly closed by eBay administration as this toy billy club was considered a weapon and as such its sale on eBay was prohibited. In my mind this little 10 inch wooden toy was not a weapon, it was an antique toy! Well now the search for an alternative to eBay began again in ernest. “For sale is an antique wooden toy billy club which was handmade sometime in the early 1900’s. It measures approximately 10 inches long. Would be a nice addition to an antique toy collection or treen collection. What struck me was the friendliness and consideration of that Etsy seller to contact me and fill me in on the spurtle possibility. I’ve learned over time that this is fairly common within the Etsy community. I’ve come in contact with some wonderful people here which I’ll described more fully in a bit. And the spurtle, what happened to the spurtle? Well it was sold to someone in Hawaii. Whether they purchased a billy club or a spurtle, I’ll never know. “Perestroika means overcoming the stagnation process, breaking down the braking mechanism, creating a dependable and effective mechanism for acceleration of social and economic progress and giving it greater dynamism.” Source: Mikhail Gorbachev, Perestroika (New York: Harper Collins, 1987). Certainly, if you buy and/or sell on Etsy, you know there is no stagnation and the brakes are off. And I, for one, have found it a dependable and effective mechanism for social and economic progress. Etsy is not just a venue to buy and sell; it’s a lifestyle, maybe even a compulsion, if you let it. The shopkeepers on Etsy are limited to selling handcrafted items, supplies to create handcrafted items or vintage goods (defined as 20 years or older). The assortment of goods is outstanding and the creativity of the artisans who sell their creations on Etsy is amazing. Each Etsy shopkeeper sets up their unique shop. They provide as much information as they care to share in their profile, create or select a picture banner and organize the shop into sections if they so choose. It takes some time to get acclimated, to learn the ins and outs. There are new terms to learn, terms like “circle”, “treasury list”, “hearted”, “favorite”, “admire”, “front page”, “convo”. I remember the first shop owner who “hearted” my shop (The Old Cottage). I was so excited! I didn’t know what a “treasury list” was for the first couple of weeks and then I received a “convo” advising me that one of my items had been included in a treasury. More excitement. One of the unique features on Etsy is the amazingly gorgeous photos each shopkeeper posts to display items for sale. A good photo will, of course, help to sell an item, but on Etsy it’s more. A good photo is coveted. You can “favorite” items and the photos of all the items you favorite are saved in a listing. You can then use these wonderful photos to create a treasury list. Any Etsy member can curate a treasury which is a listing of 16 photos of items for sale on Etsy. You should not include any of your own items, only items of other shopkeepers. It’s a way to help promote sales for others and yet also get your shop in front of the eyes of others. Usually there is some connected theme to these items and to create a successful treasury, the photos should be outstanding. Once you create your treasury, you can then post it live on Etsy for all to see. Fellow Etsians can then view the list, click on individual items included in the treasury, and comment on the list. They can also “admire” the list. All of these activities are tracked and counted. The popularity or “hotness” of a treasury could possibly catapult it to the coveted Etsy front page. For example, following is a treasury created by shop owner, Mascara Jones. 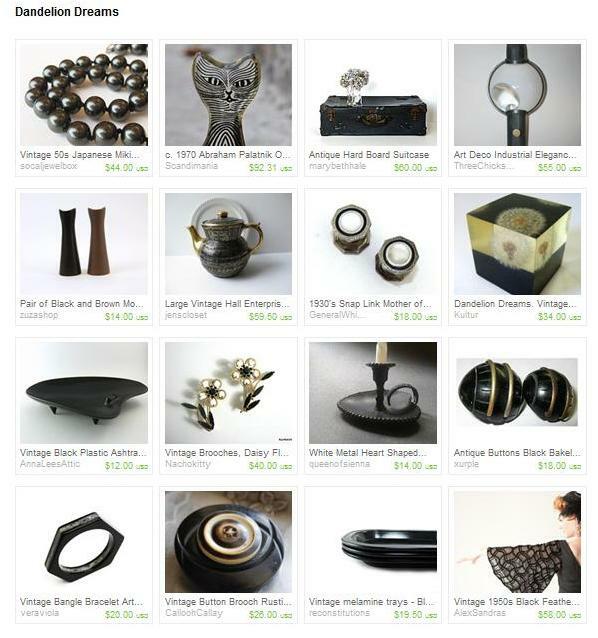 This strikingly gorgeous black and white theme treasury was created solely from Etsy Vintage Team items. 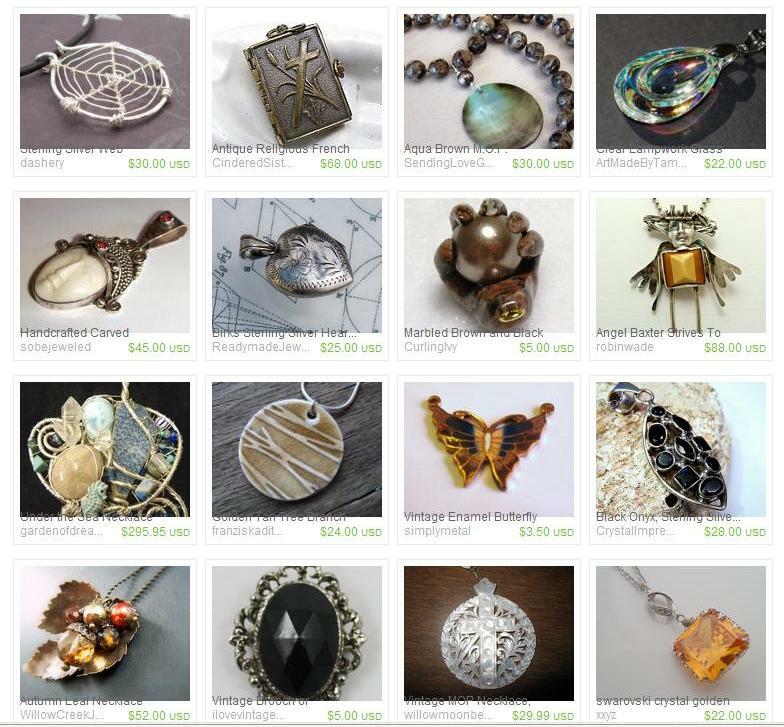 You can see the importance of amazing photos by looking at this diverse and dramatic treasury. I create treasury lists because I enjoy the creative process, the viewing and selecting and piecing together of 16 photos into a beautiful cohesive work of art. I also use the treasury as a way to support other Etsians who have commented, admired or favorited one of my items or lists. It’s my way of thanking them. I created the treasury “Pendants” for just that purpose. And this treasury did find it’s way to the number one spot of the front page. It had just over 300 views when I went to bed the night I created it and had over 1100 views when I awoke the next morning. Exactly why this happened, I don’t know. Certainly it was not an outstanding treasury; I had created others that I considered far superior. But there were a few shopkeepers who were featured who obviously promoted this list to the hilt. Today it has well over 10,000 views! There are many Etsy “teams” that you could join…such as vintage teams, treasury teams, teams according to your craft or location, age, hobbies, pets…you name it and there’s probably a team for it. And there’s a tremendous amount of community in some of these teams. Some teams are almost like family…you greet your fellow team mates in the morning, let them know what’s going on with you during the day and log out at night. If there is an Etsy shop that you admire and would like to follow their activities, their favorites, their treasuries, then you can put these shops in your “circle” and you get to follow what’s going on with them. And one of the things I enjoy most is communicating with wonderful people from around the world. I get to visit their shops, see their amazing creations, feature their items in my treasuries and have my items featured in theirs. We are a community and we are all working together for a common good: the success of our fellow Etsians as well as our own. Perestroika Etsy style…I love it! My goal is to find good homes for all of the things I have somehow acquired over the years (and which are currently filling my attic, basement, barn as well as various other locations). I firmly believe there is someone out there looking for exactly every item that I list. Most of my sales have come through an internet search engine with Google search way in the lead. And many of these people who find exactly what they are looking for in my Etsy shop are not at that point Etsy members; they join just to purchase whatever item they have found in my shop. 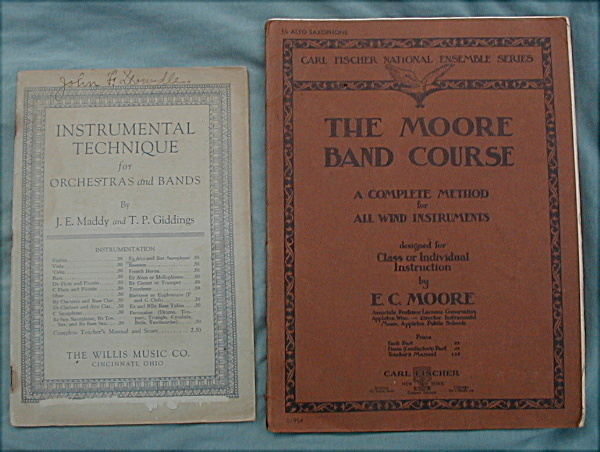 Although my first listing was the “spurtle / toy bill club” the first item that I actually sold was antique sheet music. This photo shows that I hadn’t yet appreciated the importance of an amazing lead photo. However, the right buyer was out there, found it and purchased it. I opened my shop on November 6, 2010 and sold this sheet music on November 25, 2010 for $11.98. I can’t begin to stress the importance of proper research and adequate information contained within the listing. For example, I had vintage wooden clothespins that were different…they had metal spring clips on the side. What these clips were for, I didn’t know. But I found out! 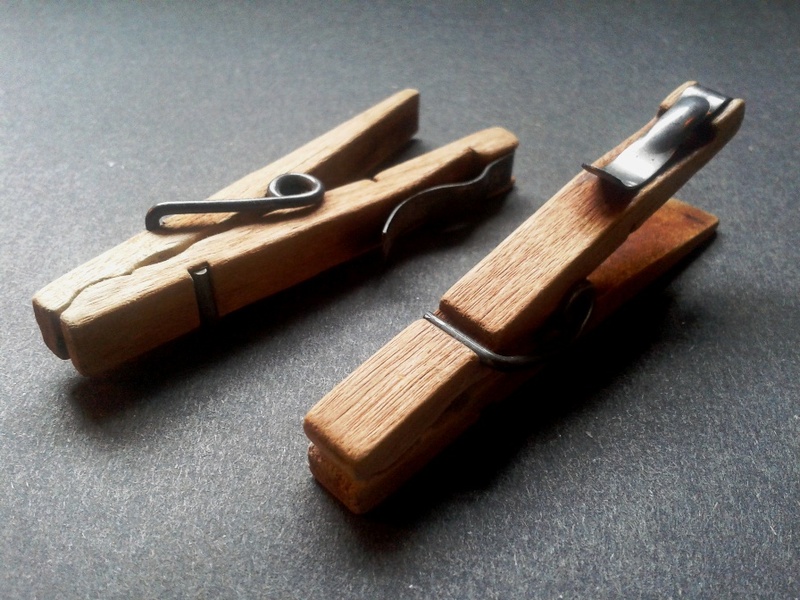 These clothespins were similar to those described by Lester H. Penley in his patent applications of 1928 and 1943. Mr. Penley’s new and improved clothespins eliminated the necessity for the freshly washed clothes to actually touch the clothes line, which, according to Mr. Penley, was covered with “dust and dirt”. I included a copy of the patent in the listing. And I also discovered that this type of clothespin was used in darkroom photographic processing. With the help of proper tagging, I’ve sold several pairs of these clothespins now. What otherwise might be landfill has found a good home. How Can I Have the Only One of These Things in Existence! Sometimes, after an exhausting research of an item, for weeks, sometimes for months, I come to the conclusion that I am the only person that has such a thing. Or at least I am the only person who has such a thing that is listed on the internet. I was unable to identify this sterling silver object for months. It was marked “6 DUO PAT June 23, 14 STERLING”. At last I found that it was a watch holder and the manufacturer was John W. Mealy & Sons of Baltimore, MD. My listing description included the following: “It is very similar to Patent No. 1,101,499 one of a series of three patents issued to John S. Murphey on behalf of John W. Mealy & Sons Co. in 1914.” It recently sold after many months…the right person finally found it. And “Peg Nappy”… I didn’t even know what a peg nappy was until I started searching the piece of glass shown to the right. 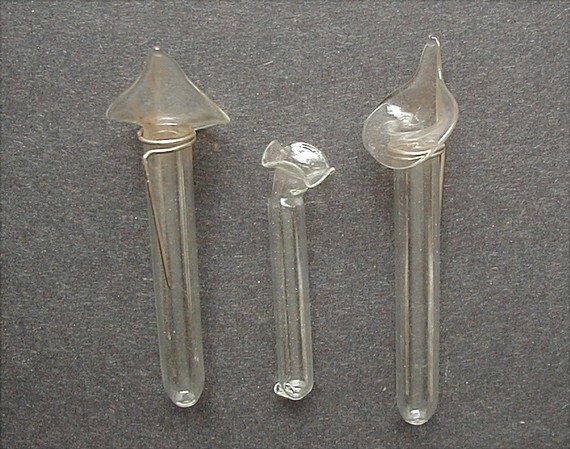 I learned that a “nappy” was a rimless shallow open serving dish and the “peg” was used to insert the nappy into what usually was a silver or silverplate base. I didn’t know the manufacturer or pattern of this peg nappy but listed it anyway, welcoming comments from anyone who could identify it. After many months, someone bought it, however, and I never did learn the manufacturer or pattern. This peg nappy story helps to support that “there is a buyer for everything” comment that I made earlier. It just takes patience and another 20 cents to relist an item. I have learned so much and continue to learn as I research items to sell. I already mentioned the Penley spring clip clothespin, the DUO watch holder, peg nappy and spurtle. But there is so much more. I’ve learned that David McConnell was much more than just the founder of Avon Products, Jack Bowman was a penniless Canadian youth who came to the United States and brought the Biltmore hotel chain to worldwide renown, Dr. Leonard Waldo patented “aluminum bronze” which was made into gold tone flatware by Holmes and Edwards, Alfred David Lenz was a sculptor, artist and President of the Art Silver Company, Morris Louis was a prolific painter whose work provides a link between Abstract Expressionism and Color Field painting, Harrison Cady illustrated “The Adventures of Jimmy Skunk”, Pierre Monteux was a famous musical conductor who was affiliated with both the Boston Symphony and London Symphony orchestras, Jo Mora was an artist-historian, sculptor, painter, photographer, illustrator, muralist and author. And I could go on and on. The research and resultant learning of obscure and sometimes not so obscure information is rewarding in and of itself. And there are always things to learn about Etsy as well as it is not a static environment. For example, I just learned today that Etsy has a Wedding Registry! I discovered this when I saw “Registry” showing up in my stats. Now if we could get some other ‘registry’ themes going! I learn and try to improve every day…and I enjoy the process. One last thing…. 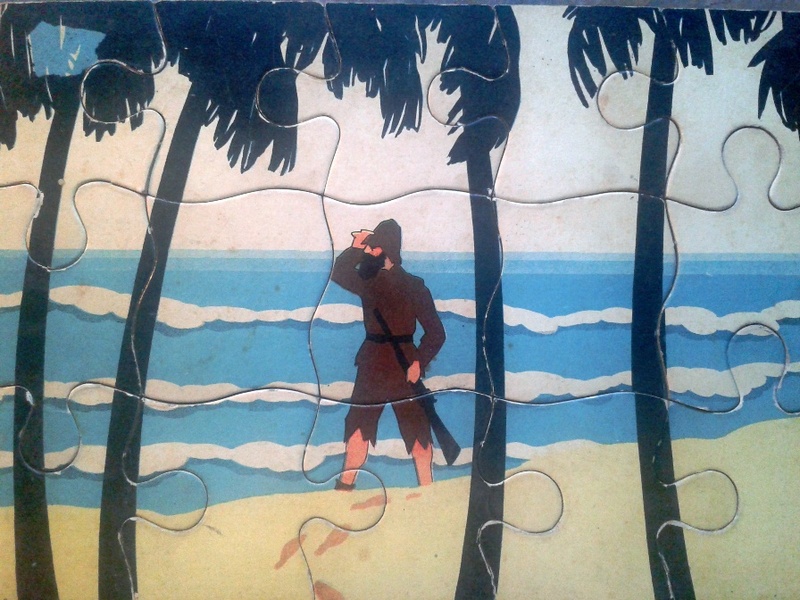 does anyone have any idea who the manufacturer or illustrator of this vintage jigsaw puzzle is? I can’t find another one like it anywhere (no surprise) and there is no manufacturer’s name on either the front or back. I originally thought the illustrator might be C. H. Lawrence but upon further research, I don’t think so. 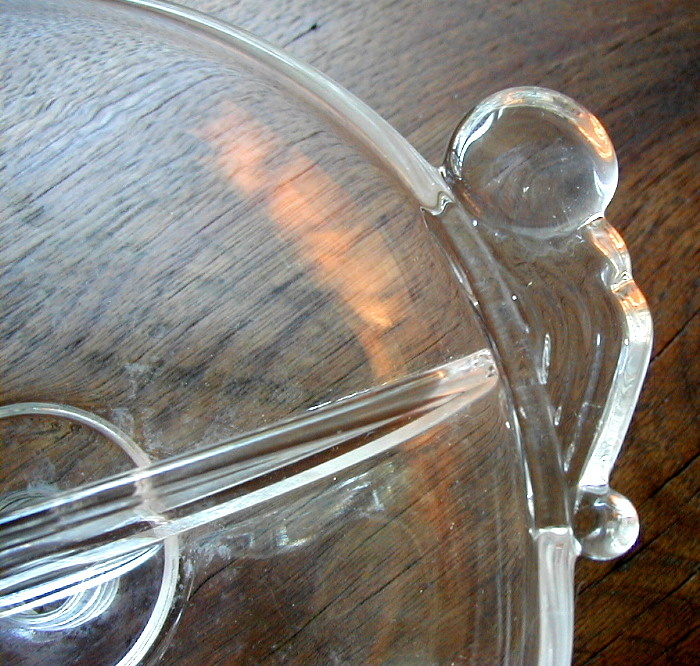 Another one of those mystery items that needs to be solved! Amazing! LOVED reading this… I have to share something funny… you talk about sharing information…well…guess what i picked up for ” free ” the other day at a resale shop… a pair of those clothes pins. I was thinking I would repurpose them… and put a magnet on the back for the fridge…little did i know, that I would be reading our Vintage Etsy Society Team blog post thread, run across your post, read your blog.. only to find out what in fact I had on hand! thank you for that… there is education and goodness everywhere! glad you are a part of our Etsy Team! Hi! You didn’t say what type of spoon and you didn’t indicate the condition. There’s a silver Rialto teaspoon on Replacements.Ltd listed at $7.99. Keep in mind that Replacements is on the high side and their items are in very good condition unless otherwise stated. A fun read, thanks. Perfect for a cold dreary Sunday afternoon.